Rated by Fortune as one their “100 Best Companies to Work for 2016,” Salesforce is a top Customer Relationship Management (CRM) company. That is, they provide companies with the tools they need to connect effectively with their customers. 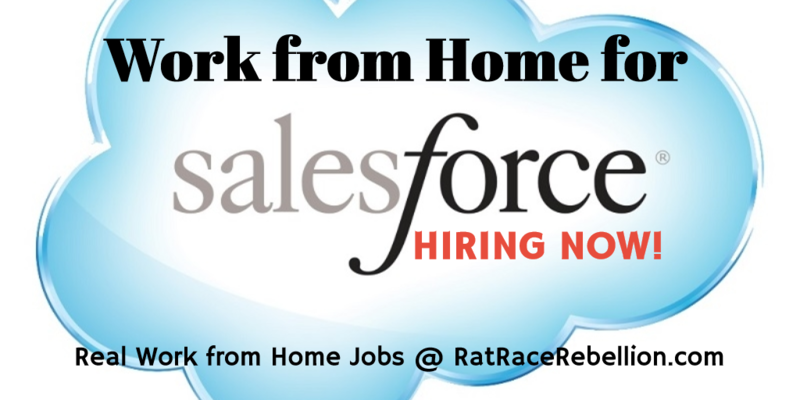 With a large and growing work from home program, Salesforce hires for a variety of work from home positions around the world. Just a sampling of current positions (there are many others) includes Customer WOW Technical Support Engineers, Account Executive, MySQL Database Administrator, Program Architect – Health & Life Sciences, Program Architects, Hadoop Administrator, Success Specialist – Salesforce1 Platform Specialist, Linux Administrator, Customer Solutions Architect, Commercial Market – Marketing Cloud, Program Architect – Financial Services, Technical Solution Architect, Lead Acquisition Product Security Engineer and Network Technology. This entry was posted in Hiring Companies, Work at Home Jobs and tagged Salesforce. Bookmark the permalink.